Authors: James Helms, Kris Luyten, Robbie Schaefer, Jo Vermeulen, Marc Abrams, Adrien Coyette and Jean Vanderdonckt. In Seffah, A., Vanderdonckt, J., Desmarais, M. (Eds. 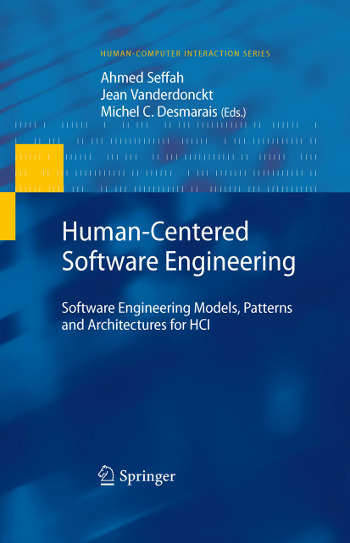 ), Human-Centered Software Engineering, Springer Human-Computer Interaction Series, Springer-Verlag, Berlin, Vol. 10, June 2009, ISSN: 1571-5035, ISBN: 978-1-84800-906-6, pp. 139-171. The User Interface Markup Language (UIML) is a User Interface Description Language aimed at producing multiple user interfaces from a single model for multiple contexts of use, in particular multiple computing platforms, thus addressing the need for multi-channel user interfaces. This chapter summarizes efforts devoted to the definition and usage of UIML 4.0, the latest version of this UIDL which also covers dialog modeling. It describes the main parts of the UIML language, i.e. structure, presentation style, contents, behavior, connectivity, and toolkit mappings, and the integrated development environment that supports the development life cycle of multi-channel user interfaces based on UIML.